stirring each ingredient in one after the other. work will also be added to the mix. up internal fog in a constructed base was a big issue. other independent zoning systems for farming improvements etc. very unwise to drive your car while drunk. spawning in certain locations, with certain loot around then. texture-based pants/tops which are coming in the editor. your attention to the PZ Wiki should you feel like editing or amending something, and the PZ Mailing List that can send blogs like this and patch notes direct to your mailbox. We also live on Twitter right here! Our Discord is open for chat and hijinks too. Happy Thursday all. Work continues on two fronts: the stuff that was developed concurrently with the vehicles build that we intend to get out into an IWBUMS beta as soon as we can, and the stuff that the five guys over at T.E.A. continue to improve our new animations system with in terms of more flexible/data-driven code and an improved AnimZed animation tool to match. Let’s go round the houses then and see what’s new. Initial player reports have been really positive – with people reporting that they’re feeling a greater sense of seasonal change and are feeling nicely hemmed in (and are having more difficulty driving) in heavy fog. The primary piece of feedback we probably need at this point is whether players feel some of the new time of day and season shaders are too intense or washed out – you can find details of the debug tools that’d be useful if you wanted to quickly check a variety out in the link above. Turbo has also just released an updated version of the test weather beta, which features a multiplayer component of his IsoRegions system – this should allow the information about enclosed player-built spaces across an MP network so fog/precipitation can only be shown in outdoor areas. Please note that this will break current saves on this test build. Turbo will now start to address some of the great feedback he’s received this past week in terms of bugs and suggestions, such as the occasional foggy starting houses and black lines that are visible on some zoom levels. In amongst the bigger headline features like weather and MP chat improvements currently in the mix, there a variety of smaller features and fixes also on the boil to benefit players, modders and admins. In-game fonts have been made bolder to help with legibility, car wrecks can now be dismantled with a propane torch and welding mask and we’re also tightening the difficulty levels of our more noob-friendly scenarios – as we can’t help but feel that some of our players are getting too easy a ride at first. Also fresh from the coding furnace, meanwhile, is EasyPickins’ in-game Sandbox Options Editor for server admins. This will allow admins to change in-game settings that don’t require a full restart, and should make managing a server for you and your friends a little more forgiving experience. This week Zac has built a ‘Paper doll’ interface into the AnimZed dev/modding tool, as seen below this replaces a big list of numbers and toggles – letting you/us design zombie and survivor outfits for in-game use and testing in a far more user-friendly and efficient way. He’s also got 2D blends working in the tool, but still needs to work out the best way to visualize them in AnimZed. A lot of what T.E.A. are currently doing is improving the system, and adding flexibility, by making large chunks of it data-driven and greatly simplifying (and modularising) the player code. It’s complicated stuff that’ll make devving and modding easier, and should put the game and community in a good shape for many years to come. This has been Grant’s primary work with the ‘state machine’ recently, while Bitbaboon Mark (although we should probably call him T.E.A. Mark at this point) working out the best ways to transition the T.E.A. workflow over into the core PZ team. Our thanks to Mad Dan for his snow pic, and indeed just for being Mad Dan. 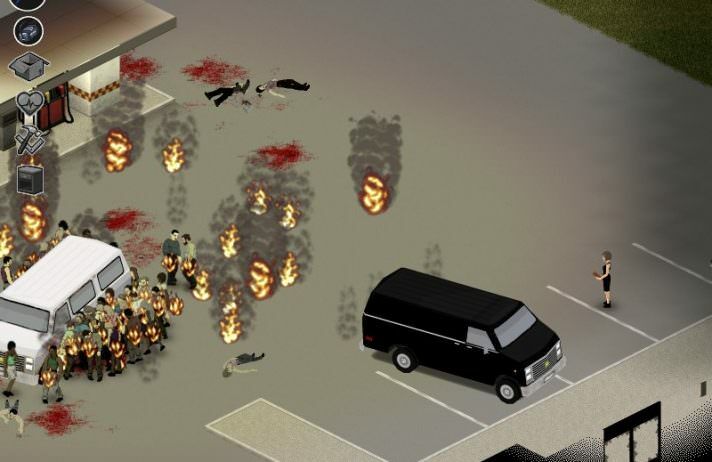 A general list of stuff added to PZ, and vids of features being worked on, is kept here[projectzomboid.com] – so you don’t have to plough through endless dev blogs for info. The Centralized Block of Italicised Text would like to direct your attention to the PZ Wiki[pzwiki.net] should you feel like editing or amending something, and the PZ Mailing List [projectzomboid.com]that can send blogs like this and patch notes direct to your mailbox. We also live on Twitter right here! Our Discord [discord.gg]is open for chat and hijinks too. We’ve just released a new test build into the weather branch, which contains many improvements to the new weather system, and in addition contains a whole slew of fixes and additions. However, we’ve had a few issues confined to only a couple of testers and think a couple of bugs have slipped into the mix that we’re having trouble tracking down or replicating reliably, and we’d love to get some wider testing done to try and figure out if this is a widespread issue or not, so multiplayer feedback would be much appreciated! Details on the build can be found here, we’ll look to get you a complete change-list in the next day or so but this is a combination of various branches so general feedback on any issues would be very appreciated! 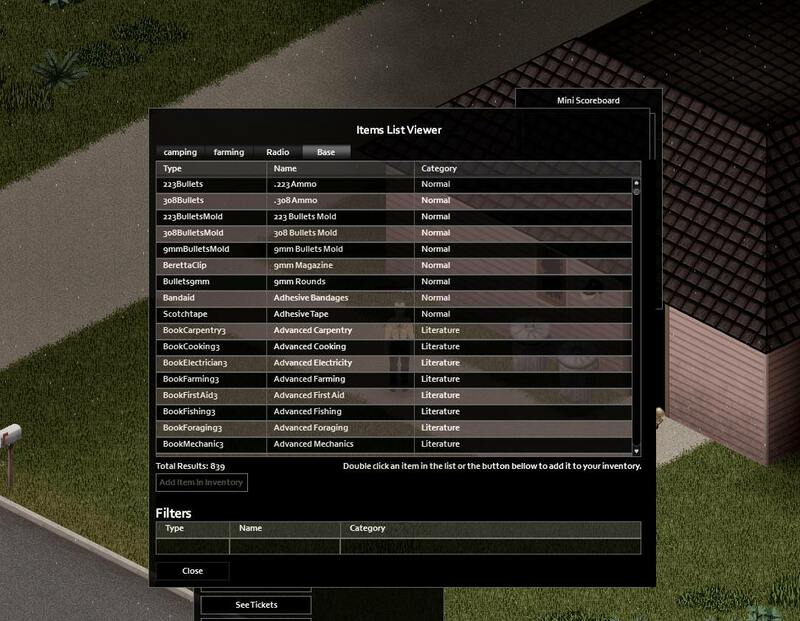 Recently we’ve had a sharp uptick of streamers playing our game, and have been paying close attention to Klean’s awesome Blacksite server (Long live Trader City) which has managed to amass 100 concurrent players on a couple of occasions–which while we were impressed it functioned at all, did start to fall down under the load. We’re hoping we can use our observations to improve the multiplayer syncing and server performance. One thing we’ve observed repeatedly in recent times is that it appears certain players seem to suffer worse with getting delayed or missing packets leading to much more extreme lag to other players. This doesn’t seem to be tied to ping, so we’re looking to investigate the lower level networking code to see if a problem could reside there that would cause some players to be starved of packets on busier servers – we’re currently looking to organize a large non-Steam multiplayer test with which to test if the Steam communication layer may be causing any additional interferance, after which we’ll hopefully be closer to nailing down these issues. We’ll post on the forums about such a test when it has been organized. We’re also noticing some oddities with sound pop up here and there, seeing people not hearing other player’s guns, and a few reports of inaccurate ranges for different sounds, so feedback on this would be much appreciated! 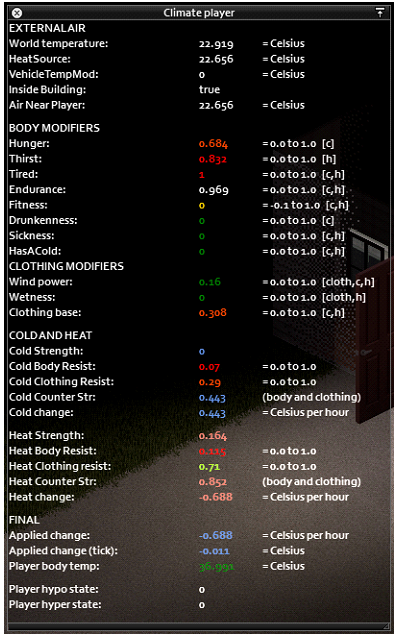 On the weather front, the test build in the weather branch has also had an update to the weather overhaul – the big focus of this build is to improve the game’s simulation of player body temperature, to more accurately model how a player will get hot or cold within the environment, with internal body temperature interacting with the character’s surrounding with various modifiers based on the character’s situation, dress and health. Extra elements are simulated such as sickness lowering resistance to cold, wind and rain reducing the player’s body temperature, as well as adding hyperthermia and hypothermia into the mix. We’re aware we may have to provide more ways for the player to handle extreme heat or cold, such as more varied clothing – some of this will clearly need to wait until the animation build, so we’ll decide in a future test build whether we need to disable or reduce the more extreme temperature effects until these features or added. If people are giving the new temperature system a try out, you can pull up some debug information to track the player’s body modifiers. This will hopefully show the depth of these systems! Full details on the weather build can be found here, with instructions on how the new body temperature system works. Yuri’s been improving the look of the vehicles, adding environment maps to make cars look much less matte and have the reflective shine one would expect. 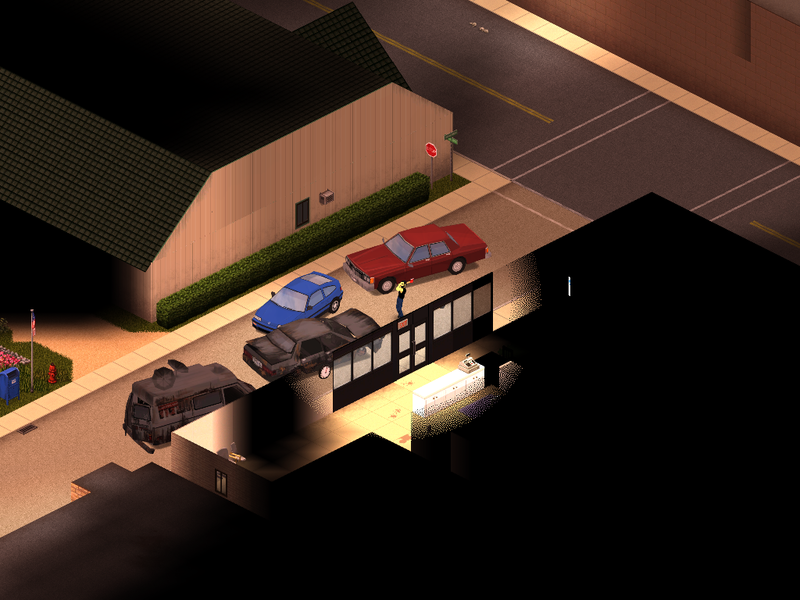 We’ll probably have a lot of fun tying the reflective values into how clean a car is, and providing another weirdly in-depth mechanic to the vehicle system in Zomboid in future! Welcome to this week’s Thursdoid! (Last week's Thursdoid can be found here) We’re a bit light on the team this week as a few of us (including, as you can probably guess, the developer in charge of Thursdoid punnage) are having a well deserved holiday after the exhausting and mega stressful vehicle push for so many months finally came to an end, and like buses several of those holidays coincidentally happened to come at once, but still a few things to report. Various fixes include reintroducing the low lighting mode, and an option for disabling the new building hiding system, which will provide better performance on low end machines (more on this subject in a moment), removed the weird sound echoes, various Linux compatibility / java fixes, fixed multiplayer zombie attacking / defending issues, and many more. We’ll try to get you a complete change-list soon. Work continues apace with animations, nothing flashy to show or talk about, but many fixes have been made to the tool and Martin the animator now has access to regular builds to help integrating all the anims. Steve at BitBaboon nears completion of the new build system overhaul, which will vastly improve our internal organisation of builds, and should allow us quicker testing and releasing of builds. With this we’re making wider changes to the team organisation to help us deal with the bigger team size and the various irons we have in fires. We’ve had a small number of people reporting that cars are invisible on their low end machines. This is due to the fact that the way the vehicles are rendered require shaders to overlay damage and other effects, so cards that are unable to use shaders, as with the 3D characters which use GPU skinning, will not be able to render the vehicles. We’ve fought for many years to keep our minimum specs where they are, wanting to keep our potato running Zomboiders in the game for as long as possible. However, as the years progress, the numbers dwindle as more people upgrade, and at this point we’re talking about an extreme minority of PCs, bottom end Intel laptops any of them close to or over a decade old, at least in terms of technology, and constituting less than 1% of all our customers – It’s gotten to the point where retaining compatibility with machines mostly over a decade old is starting to hamper development in several ways. 1) For example to add support for vehicles for this minority of machines, including testing and bug-fixing would take a substantial amount of development time, which at this stage could be spent working on the features, optimisations and improvements the vast majority of our customers would benefit from and that would take us toward the fabled 1.0. 2) There are a whole host of avenues for optimisation that we’ve for a long time written off because they would end up raising the minimum spec by requiring shaders to work and would be too fundamental to switch off. Since the game and simulation have become massively complex at this point, optimisation is becoming ever more important. Vehicles at one stage ran so badly on top end machines that we simply had to spend significant time doing extreme and very disruptive optimisation work, and the game still doesn’t run adequately in built up areas on machines that should on the face of it be able to handle it. However the available routes for optimisation are becoming extremely sparse–there’s only so much blood you can wring out of a stone and we’ve shaved practically every millisecond we can from the game’s frame time, so we really need new directions to be able to explore to keep the game running well particularly when features such as Louisville, the new animations (which will bring performance benefits and pressures, and it’s unclear what the net result will be) and of course the NPCs go into the game. The way the rendering system works with the lighting, shading and isometric perspective is hugely costly and it’s difficult to see how it can possibly be improved having no guaranteed access to literally any of the rendering advancements developed in the past 13 years. Having guaranteed shader support will open up many optimisation opportunities in the future, our rendering being far and away the biggest bottleneck, and there comes a point where it becomes unfair to the huge majority of our customer-base not to exploit these. While it’s frustrating the game not running well on an old laptop, it’s certainly much worse for it not to run well on a top of the range gaming PC and that’s something we have more responsibility to fix and avoid in future. So while we understand this decision will upset a few of you (though it’s a decision we hope you appreciate we did not take lightly, and resisted as long as humanly possible to give as many the opportunity to upgrade as possible), we hope that the few affected by this understand why we’ve come to this decision. In the meantime, build 38 will always be available via the Steam betas, and there are many affordable old laptops with GPUs that have the requisite shader support, so hopefully we’ll see you back in the new builds before long. This week’s tense disagreement from QwencGames. A general list of stuff added to PZ, and vids of features being worked on, is kept here – so you don’t have to plough through endless dev blogs for info. The Block of Italicised Text would like to direct your attention to the PZ Wiki should you feel like editing or amending something, and the PZ Mailing List that can send blogs like this and patch notes direct to your mailbox. We also live on Twitter right here! Our Discord is open for chat and hijinks too. 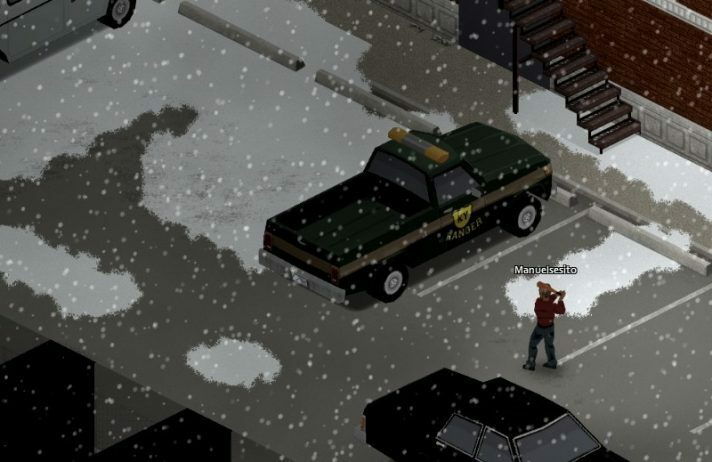 • Turbo has hooked the Winter is Coming game mode to the new climate system. After three full days of preparation time a powerful weather period is generated, that will always feature a blizzard. The mode will still follow seasons, of a sort, with the mode’s ‘Summer’ having a high temperature of 0 degrees centigrade, and the ‘Winter’ dropping to -30. A time-lapse of the initial Blizzard in Winter is Coming can be seen below. • RJ has coded a new MP Admin UI to help server owners quickly search through, and spawn, items. It looks a bit like this. • Stas has continued to update his new chat system – and this version has a bunch of bugs fixed that have arisen in testing, alongside a much neater fade-in and fade-out for the input field. • New car stuff: When dismantling a car wreck metal items are now spawned on the ground instead of player’s inventory. 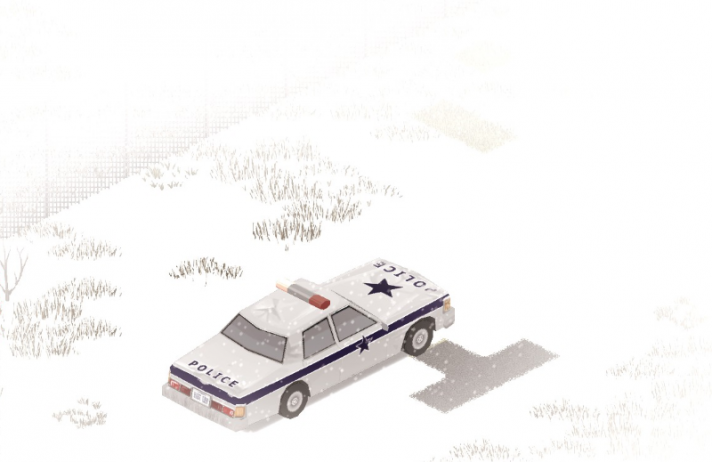 The player can also now sleep in a car that has its engine running, and Turbo has also played around with the visibility cone when driving through more intense weather effects. • General Arcade’s Yuri has also exposed various elements of the vehicle code to modders, essentially rewriting stuff like LoadVehicleModel and vehicle spawn governance, in lua. This will aid modders who want to add in new/individual cars to operate alongside the existing ones of the vanilla game. He has also written a guide for this, which will go onto the forum in the coming week. The full changelist for 40.7, which also contains a lot of handy fixes and tweaks, can be found here. If you missed the full current changelist for the version 40 weather beta last week then that can also be found here. This week’s roof garden from Eddie. A general list of stuff added to PZ, and vids of features being worked on, is kept here – so you don’t have to plough through endless dev blogs for info. The Block of Italicised Text would like to direct your attention to the PZ Wiki should you feel like editing or amending something, and the PZ Mailing List that can send blogs like this and patch notes direct to your mailbox. We also live on Twitter right here! Our Discord is open for chat and hijinks too. Hey all, we have just moved Build 40 into the wider IWBUMS public beta – which contains Turbo’s weather and climate system (proper seasons, new shaders, fog, mist, storms that move over the map etc), vehicle improvements and an awful lot of gameplay tweaks, balance and bug fixes. A brief ‘highlights’ changelist can be found below, while the full changelist can be found here. Please leave feedback in the thread, and bug reports here. Details on how to join the public IWBUMS beta can be found here. • There *might* be an annoyance with players still getting wet and feeling temperature effects in vehicles, though this will be patched pretty soon if so. Likewise, – the general impact of temperature on players will be balanced over the course of the IWBUMS beta. • This version has various aspects of car integration converted into Lua so that modding full cars, not just changing skins, is now a lot more viable for modders. Yuri has written detailed guidelines which RingoD has posted up here, and we’ve also included a new script to help you convert textures into PZ’s required form. • A lot of engine work and general vehicle improvements have carried on into this build, but still require substantial testing on servers – not to mention a lot of improvements and fixes we’ve been making to MP Admin in general. Feedback on MP, and especially people connecting to distant servers, would be much appreciated. We will be bringing our own public SpiffoSpace IWBUMS test servers online next week. • Full weather and climate simulation system recreating true-to-life weather patterns through 365 days of the year. Morning fog, thunderstorms created by virtual weather fronts that move over the map, improved rainfall visuals, visible snowfall and improved rendering to better evoke the time of year, and the time of day. New SFX. New player character temperature system. • New MP Chatbox. Primary features include separate chat streams (safehouse, local, global, etc), customizable chat and more intuitive usage and commands. It’s hopefully a lot more convenient now. • New system to convert objects placed by mappers so they can be used as functional game objects. This covers items like barricades, campfires, rain barrels, traps, composters, crops etc. • Winter is Coming game mode now works with new climate system. Seasons still impact on this mode – ‘Summer’ highest temperature is 0 degrees centigrade, and winters may drop to -30. After 3 full days a powerful weather period is generated, that will always feature a blizzard. • New MP Admin UI additions including an Items list viewer in the admin panel that can be used to quickly search through, and spawn, items. Also includes the functionality to change in-game settings on the server that don’t require a restart, and clear ways to change admin powers within the UI so hosts can remain admins and play along without advantages. • Improved car handling. New driving traits. New car-battery charger item that’s placed on the ground and interacted with using a context menu. Drunk moodle now has an impact on driver steering input. Players can now be harmed when hit by a car. • Car wrecks can now be dismantled with propane torch and a welding mask. Gathered metal material will depend on your metalwork skill. • Many UI changes to handle different font sizes. Added context-menu font-size option. Re-exported the map to improve zombie density in some farmland and rural areas. • Changed First Week and One Week Later and adjusted settings to make sure that new players aren’t given too easy a ride. Removed Initial Infection. 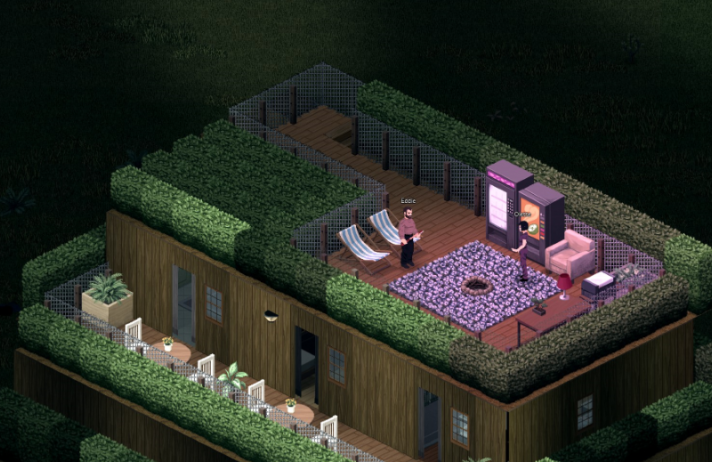 • Added Display option to disable the new roof-hiding feature for low-spec users. Updated menu screen with vertical rather than horizontal options – due to problems with taskbar in latest Windows Updates. • Added chevrons on character screen next to the weight to indicate if weight is increasing or decreasing. • New isoRegions system to detect an enclosed area – player-made or dev-created – to keep weather effects on the outside. • New functionalities for the PZ sound system. Formerly modders couldn’t override sounds in PZ FMOD soundbanks, so when players find certain sounds are too loud or annoying (heartbeat, zombie alert, flies, level up noise etc) it was hard to raise/lower them independently. Details about all the game sounds now go into media/scripts/sounds.txt. A new in-game UI allows users change the volume of any sound they feel is too oppressive. We’ve just released IWBUMS beta 40.14, which is another release that’s primarily fix and polish – our current aim for the devs working on this build being to make lots of quality of life corrections and adjustments while Turbo finishes his weather/climate work and the version can get a full public release. You can see the patch notes here. To this end this version fixes missing raindrops, absent MP storms and other climate errors – while EP has also figured out the annoying sound volume and delayed sound issues, which should now be eradicated. The telepathic ‘terminator’ zeds trailing after players in MP that several of our IWBUMS testers have reported have also been stripped of their powers. EP has also made improvements to alleviate longstanding woes with zombies appearing in your vision cone all-too-late in large buildings like the Mall, and Yuri has made fuel caps more accessible through his vehicle anti-clipping force-field. EP has also been through all the various vehicle features and made them operate as you’d expect when the car battery is dead or uninstalled, also having them still operational until the car is powered down when the battery is removed and the engine is going. Another minor, but irritating and ancient, bug he’s figured out is the frozen food that’s been spawning in freezers long after the final power outage. Please be aware that SpiffoSpace remains open for IWBUMS testing. This server, based in France, has no password and can be found by anyone running the beta (access details here). Once we’ve added in some admin power over weather (admin-triggered storm/snow/fog etc) we will be coordinating a Community Megatest on here. Due for internal testing over the weekend and early next week, Turbo has redone the way the IWBUMS beta currently has changes in temperature, and resistance to hot and cold, impact on the player. Although it works okay-ish currently, the edges were too rough – and deaths were often broken/cheap. His revamped system focuses on how resistance to the elements is calculated – and the way it takes hunger, thirst, worn clothing, wetness and exercise all into account should be a marked improvement. The temperature ‘safe zone’ range will be wider too, and the system takes ‘real time’ minutes into account rather than ‘game time’ – so fast forward peril is decreased, alongside being dead by dawn next to the embers of a camp fire. The next version will also improve weather visuals to better distinguish rain from snow, and add in temperature conversions – so our Kentucky setting gets its proper and correct Fahrenheit readings, rather than horrid old European centigrade. While the four guys over at T.E.A. continue to work on our new animations system, we thought it might be worthwhile mentioning the fifth horseman of that build: our music composer Zach Beever. Since animations are such a fundamental evolution of the game, we want a whole bunch of new music to bring players along emotionally with the new visuals. Zach’s been working with us for months now, preparing a whole host of new tracks, many including familiar themes and motifs from old favourites. Rather than drip them in one by one, and to give him time to work on them as a collective whole, we felt their impact would be far greater if they all went in together. To this end, behind the scenes, Zach has now completed 19 new music tracks, with more to come – and a part of one of the latest can be heard below. For thoughts on his direction and inspiration for the music, we thought we’d ask the man himself. Behind the scenes there’s currently a lot of conversation about revamps of existing systems (farming, last week’s thoughts on polishing the power outage etc) but something else we’re discussing are ‘survival-style’ skill and recipe-based enhancements to vehicles. To which end, we thought we’d float this image of our potential direction with this in front of the community – to gauge opinion and gather some feedback. Please note that this is NOT a final representation – it requires a full art pass, not to mention a lot of coding work that will likely come from General Arcade’s Yuri for a future build. It does, however, show how a modular model system could work – and we’d like your thoughts on it. It’s currently the Annual Penisham Celebration on our forums. Feel free to join in, but be aware that Penisham will only be available for another five days. Hey all, here’s a quick run-down on where we’re at with Build 40 and beyond. With the final touches being made to build 40, we’re now at the point of making a decision on what to do for the next build. The issue with huge features like our new animation and clothing system, and everything that comes with it, living on another code branch is you tend to have to play catch-up a lot. The developers on the base game add or fix things on the non-animation branch, those changes need merging in – and due to the vast differences in the underlying code due to the animations this tends to add in extra work for the four guys over at TEA working on the new systems. This will mean that every developer at Indie Stone, including the chaps at TEA and at General Arcade, will all be working directly on the same version, and the focus of the entire team will be shifted onto making sure the entire game functions with the new animation system. There is still a lot to do, there’s a lot of game there and things like cars and multiplayer will need some work to get functional, but this move will commit us and the next non-hotfix and non-patch build after 40 goes live will be the animations build. It also means that blog updates about it all (once the dust has settled from the big switch-over) will hopefully become a bit clearer and less dry and technical. As well as, say, this week’s news that ‘Zac has made improvements to the BlendField renderer to help visualise how the anims blend together’ we can increasingly show how the PZ gameplay we all know and love/hate is coming together with the new visuals etc. Which will hopefully prove less frustrating. Before this happens, though, TEA need to bed down a few things and prepare some documentation –and we need to get Build 40 out of the door and patched. So…. We just released version 40.17 to the IWBUMS beta, patchnotes for which are available here. We’re pretty much done with Build 40 at this point, but do need to smuggle in some more temperature balance and seasonal SFX. We’re going to do a new internal test build for 40.18 tomorrow with some required fixes for admin commands and the chatbox, with the intention of then releasing it to IWBUMS early next week so we can have one final Community Megatest to shake out any remaining cobwebs. There will, as always, be free PZ codes for people who help out – and due to the additions to the game mentioned below it should be a lot of fun. Please keep an eye on the forums for details. • Turbo has added climate and weather MP admin panels that should make for some really interesting roleplay and gameplay opportunities on PZ servers. Storms, snow and fog can be triggered at will to cover the entirety of the map – as well as overall climate values can be now be ticked to override what the game has conjured itself depending on what time of year it is. Server admins can also play around with how night appears, whether the game appears in monochrome etc We’re hoping that it’ll be a lot of fun. • Rain and snow now look like they hit the ground, which makes for a huge visual improvement. Rain then disappears, and snow fades out. Likewise, Turbo has also fixed how precipitation wasn’t clearly visible when zoomed in. • There’s also a bunch of fixes including: issues with various in-game tiles, gun sounds not being heard far enough away in multiplayer, two bugs that spawned a random zombie in a barricaded bathroom and the ability to learning from the TV and radio when asleep. As mentioned in recent weeks, we’re now on clean-up duties before the release of Build 40 – which will then be patched with whatever’s necessary, before the animation branch being worked on by the guys over at TEA is fully merged into the main dev codebase for work on Build 41. Last week, on IWBUMS beta 40.21, we put in the reflective windows skybox to better show season/day/night (and in prep for a future build’s reflective water), and also included Turbo’s more natural-looking snow, which can also be seen in the featured image above. In the mean-time we’ve had several other test builds backstage, and are now putting out beta version 40.25. The full changelist can be found here, but the headlines are below. • Weather patterns are now more random, generally shorter, less intense in terms of screen darkness and have more periods of clear sky. • Cloud patterns seen on the ground have been updated, and have new textures – night has been improved. • Ground snow accumulation has been improved and updated, also working better when snow is turned on with admin/debug tools. • Weather periods can now also be fully modded, including a designated ‘modded’ stage which can be freely modified. • Insulation properties of different clothing now more clearly shown in the UI. • Spawns have been added for McCoy Logging and Fossoil vehicles, which weren’t appearing – alongside improved car spawns at gas stations in general. 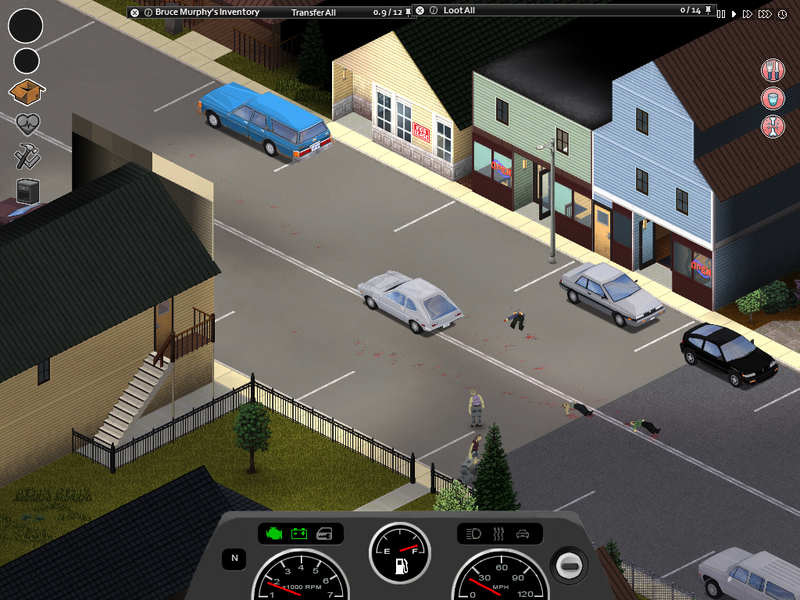 • Fixed: various chatbox and admin issues, a longstanding MP issue in which loot was respawning way too soon, the weird tile visual effect with some zombie corpses, crowds of zombies launching cars like bottle rockets (!) 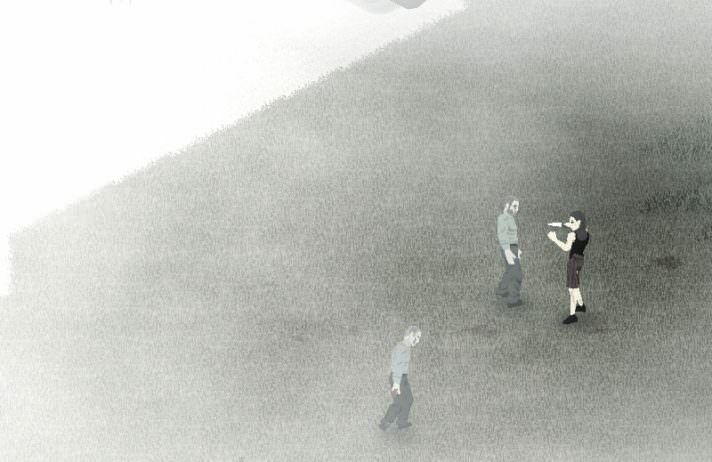 and players sometimes being trapped in their car (and zombies getting confused) by Yuri’s invisible anti-clip forcefield. We will be holding an IWBUMS Community Megatest tonight to see how many major irritations remain, and to gather info on the login issues that hampered the last Megatest – should the same problem arise. If you would like to join in then keep an eye on the TIS forums. Free PZ codes for participants will be available (usual conditions apply) but please note that this isn’t a stress test so the required player number on the server might be limited. It’s been a busy week for TEA preparing for the code merge of the animation build into the mainline development branch as soon as build 40 goes final. They have completed the vast majority of the tasks required for the handoff, at which point they will continue to work on bits of extra technology to make the main animation build development go smoother, and end up with better results, while the rest of the team beavers away converting the main branch’s character states to use their new fancy state system. TEA have implemented all the character control and combat features that were present in the early animation build, but with the new elegant and fast to implement data driven state logic that will act as example for the rest of the team to use as a basis, as well as being a much more robust and bug free base than what existed before, so we’re hoping that while it certainly won’t be a quick task, with the entire team pushing toward it we’re hoping progress will be swift, and we can finally start showing more exciting videos on the Thursdoids with the confidence that they are finally around the corner. Animations represent a huge amount of work as well as a linchpin for the rest of the major features to be implemented into the game. Each build after and including animations (intermediary quick builds aside) on our roadmap to 1.0 and filling in those missing features everyone has been waiting for (yes, those). It’s going to be an exciting 2019! After the hand off, TEA will be looking at some extra tech, such as animation retargetting, which will not only mean a much easier time for modders to implement their own animations and models by allowing animations to be adapted to slightly differing skeletons, but will also save poor Martin many many hours of reexporting hundreds of animations whenever we decide to add a bone to the skeleton (looking at you, backpacks!). In addition, they are going to look into finally getting the proper rotation blending working nicely, which has been a thorn in our side since day 1, and would if nailed allow for better turning and much more immersive turning animations. Though obviously it’s key that we retain the nice responsive character movement, so we’ll need to experiment with how to allow for animated turning without the character feeling sluggish to control. This week’s snow scene from Taquitosito. A general list of stuff added to PZ, and vids of features being worked on, is kept here – so you don’t have to plough through endless dev blogs for info. The Block of Italicised Text would like to direct your attention to the PZ Wiki should you feel like editing or amending something, and the PZ Mailing List that can send blogs like this and patch notes direct to your mailbox. We also live on Twitter right here! Our Discord is open for chat and hijinks too. Hey all, here’s what’s happening. Build 40 is for all intents of purposes done now, with one addition that might need a few fixes that we’ll explain the reasoning behind below. • New, rare, inventory clothing types to better insulate players. • Fixed map bugs. Fixed missing vehicle skids sounds in MP. Fixed broken MP car locks. Fixed container bugs. Lots of other fixed bugs. Being the first product of Bitbaboon Steve’s new internal autobuild system though, there were a few teething troubles that caused issues for our Linux server operators. Which has expedited the release of today’s Version 40.27. This contains remedies for annoying small tree collisions, and car battery fun.. but predominantly it contains the below. • Trees shaking slightly when the player is chopping them down. Work continues with the TEA’s preparation for the entire team moving onto animations once 40 is final and patched, a lot of it under the bonnet kinda stuff. A big improvement to the animation system and tools is the ability to clone animation states and override aspects of them without needing to completely duplicate the state logic that drives it. An example of this would be for handling (quite literally) weapons while walking, strafing or attacking. We can now define the core states for handling walking, strafing, sneaking, attacking without a weapon equipped, and then creating other states using that as a template that say hold a one handed weapon, or a gun, and substitute animations while still retaining all the logic tying together and blending the animations with the gameplay. Functionality such as this will speed up Animator Martin’s job of implementing all these states into PZ, and cut down the replication of work from the coders once we’re all inside the system. • We’d like to welcome ChrisW back to our bank of coders, who will be picking up where he left off with the Sims style cutaways we’d like to make internal building navigation a bit slicker. • As mentioned last week RJ is now working with Xeonyx, creator of New Denver, to help debug his new Hollywood Studio map and come up with an Official PZ Challenge system for it – for when it’s added to the main game. Here’s another screenie from it. This week’s sunday service from KurtZ. A general list of stuff added to PZ, and vids of features being worked on, is kept here – so you don’t have to plough through endless dev blogs for info. The Centralized Block of Italicised Text would like to direct your attention to the PZ Wiki should you feel like editing or amending something, and the PZ Mailing List that can send blogs like this and patch notes direct to your mailbox. We also live on Twitter right here! Our Discord is open for chat and hijinks too. To both of you out there who aren’t playing Red Dead Redemption 2 right now, we have a treat! Build 40 has been officially released! Build 40 contains a simulated weather and climate system – recreating true-to-life weather patterns through 365 days of the year following a virtual warm and cold front system. Once this version is out and fully patched, then the team will moving into the animation codebase currently being prepped by our friends at T.E.A. for Build 41. As far as Build 40 goes, the following video gives you a brief taster of what to expect. 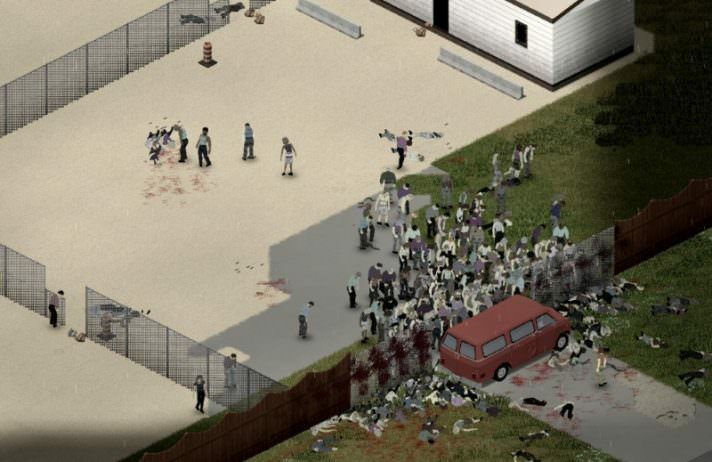 • Storms that pass over the Zomboid map. • Different levels of fog and mist, that will often clear during the day. • Simulated wind speeds that can be seen in the moving foliage around you, and in how precipitation falls. Trees sway, and move when crashed into – or hordes pass through them. • New shaders and post-processing effects to give a better feeling of different times of day, and for different seasons and times of year. • Improved rain effects, with more realistic ground impact. • Improved snow and snow effects. • New Chatbox. Primary features include separate chat streams (safehouse, local, global, etc), customizable chat and more intuitive usage and commands. It’s hopefully a lot more convenient now. • Reflective windows on vehicles and skybox generation. This takes into account: the time of day, the Global illumination color, fog, cloudiness, precipitation intensity, wind direction, wind speed and the temperature of the ambient air / cloud level. 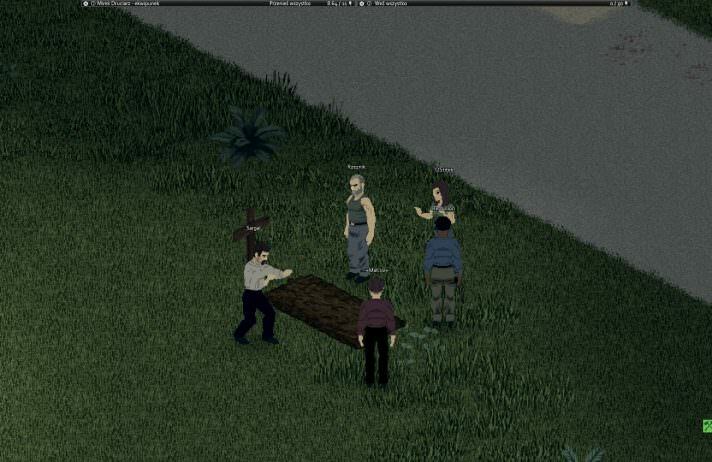 • Added ‘shake’ sprite effects for hits on doors, chops on trees and zeds/players walking through vegetation. • System to convert objects placed by mappers so they can be used as functional game objects. This covers items like barricades, campfires, rain barrels, traps, composters, crops etc. • MP Admin Items list UI that can be used to quickly search through, and spawn, items. 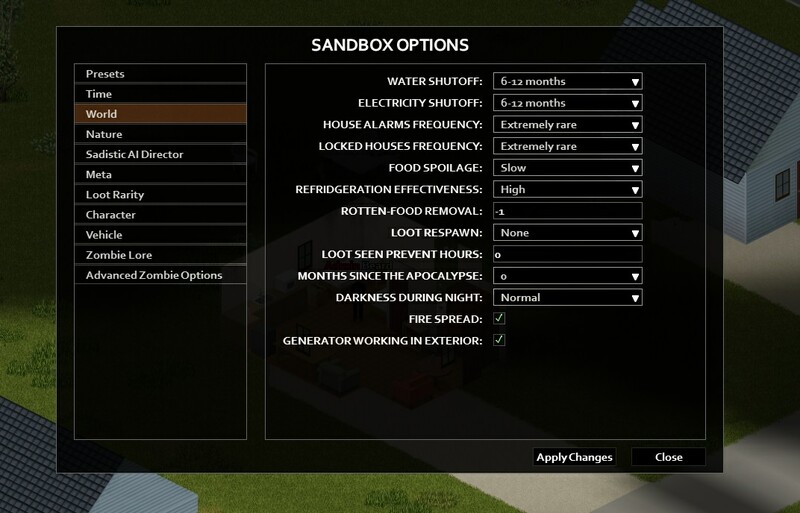 • New MP host Sandbox options that can be enabled, where possible, in-game without a restart. • New C++ version of ZombiePopulationManager. This system is what governs the placement and movement of zombies when they’re not directly on your screen, and this updated version should be an optimization for SP and MP – hopefully helping out lower spec machines and busy servers. • New weather-based challenges: A Storm is Coming, and The Descending Fog. Improved Winter is Coming challenge. • Also: Car battery charger now available. Driving drunk is no longer recommended. MP players can now be damaged by cars. Clearer weight gain and loss. Revamped PZ sound system. Loads of optimizations, MP and Admin improvements, map fixes, improved UI readability, a fair bit of balance and 300+ general fixes. For the full changelist and details on all the balance changes and fixes please check here on the forums. As ever, we do rigorous testing both internally and within the IWBUMS community beta channel – but due to wide range of hardware out there in the Steam wilds there will always be issues that need to be fixed after a build release. So please have patience while we patch up anything that arises. • More frequent changes in weather systems as the weeks tick by, and a little more extreme weather. We were concerned that people weren’t seeing enough of the new weather events, particularly rain, and so things should be more variable with this patch. We would still love to hear feedback on the current build’s weather too, and if you’d like to let us know then the relevant thread can be found here. • Some restored/improved chat functionality, and admin commands. • Sandbox options for snow on the ground, and rain/fog fx intensity. • Fixes to player wetness: you won’t get soaked inside tents anymore, and likewise driving with a smashed windshield will get you wet. • Fixes with crate-stacking, car horn/alarm radius, MP door and tree shake, construction issues, vehicle reflections and various other stuff. We aim to release this next week, although also plan to look a few other areas including issues with the muted appearance of indoor lights, flashlights and headlights during night scenes. In terms of build 41 TEA have provided all the guidelines and reference materials for our own coders to get to grips with what’s required of them, which in time will also be released for modders. We’ve also got an irl meet-up for our Europe-based team coming up soon, where we’ll be discussing the changes and what other cool stuff they can bring. In the meantime this week Zac has continued to improve the AnimZed dev and modding tool alongside Animator Martin, and now has the Clothing module bound in nicely so Martin can quickly add new costumes and ultimately bind them to in-game inventory items. He gave us a quick demo video to show the system in action as seen below, being able to quickly switch the player’s costume with the external tool. Please be aware, though, that the tool is just demoing costumes and items held in hand. It hasn’t been set up with all the custom animations for holding weapons, so the guitar will obviously not look as wonky in the finished thing. General Arcade’s Yuri is already inside the anims build, and working on his new water shader. These are the current fruits of his labour, although currently the system doesn’t know where water borders can be found on the map. It does work as a proof of concept though (faaar down the line! like: real far) for localised flooding. This week’s featured image (that we’ve used to make a pun on a Dickens novel that starts out with a lot of fog as a vague attempt to make use of a degree in English Lit) from ♔Потерянная.ѡℛ. A general list of stuff added to PZ, and vids of features being worked on, is kept here – so you don’t have to plough through endless dev blogs for info. The Centralized Block of Italicised Text would like to direct your attention to the PZ Wiki should you feel like editing or amending something, and the PZ Mailing List that can send blogs like this and patch notes direct to your mailbox. 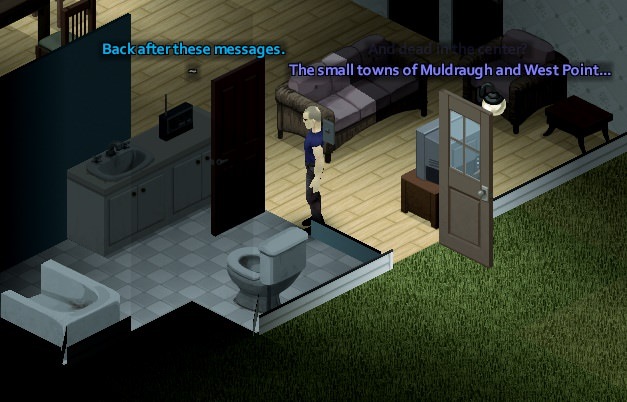 • Local text chat now audible/legible from a distance, and no longer obscured. • Weather period frequency throughout the whole year increased, and more heavy weather. • Car alarms now attract zeds again. One of the biggest problems with Build 40 on release was that the new time of day, and time of year, shaders didn’t play very nicely with the lighting system. Flashlights, internal lighting and vehicle headlights all suddenly look very washed out. Players who venture out in the dark weren’t having as much fun as usual. As such, Turbo has been working on an improvement that we want to get into the current public version before he moves fully into Build 41. Vids of this can be seen below. We hope you agree that it looks far, far better – and more than a little scarier to boot. We’re transitioning the PZ coders over to the work that TEA have done on animations for Build 41, but in the mean-time guys like Zac and Grant are continuing to improve tools and, in the case of Grant, do some optimization of the anims codebase. • A ripple effect has been added to the water, that will let players to see the direction and speed of the wind added to the game in Build 40 on the water’s surface. • The water shader now accepts data for flow direction and speed for each tile in the map, so rivers are now more realistic. In the video you can see how the water flows more slowly near the bank, and also how the flow of water smoothly changes its direction along the river. • Three water ‘visual quality’ options have been added. There is now a high and low quality option for both dynamic water and static water. Low quality dynamic water puts a very small load on the GPU, so it should be okay on most PCs. You can also see Yuri playing around with the different debug values for this system here. 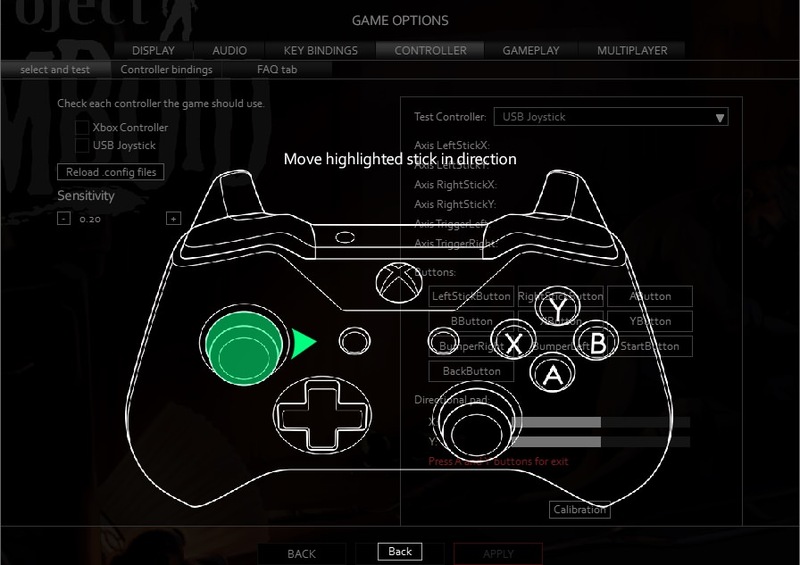 We’re currently running a beta for the work that Stas has recently been doing on gamepad controller improvements, and folk have been contributing some absolutely brilliant feedback. If you enjoy playing PZ with a pad want to join in, and earn yourself a FREE PZ CODE, then simply visit this thread[/b], install the controllers beta, play for a few hours and answer the ten questions we’ve provided. This morning we released a new version of the Controllers build using your feedback, and Stas has quashed many of the bugs that were irking people. So now is a great time to join in. Please note that currently only PC players can run the build, and also that the joypad back-end system, configuration and bindings have been completely rewritten from the ground up. In the process some aspects of the controls and default bindings have been changed in the rewriting process – if you have any issues with the default bindings and behaviours of the controls we’d like to hear about it. A quick shout out for Xeonyx, the creator of the wonderful map mod New Denver – which has recently been renamed as Slocan Lake. Jamie is now making Challenge maps for the main game, the first of which will likely appear in Build 41 at this point, but wanted to bring his most famous mod creation up to date. 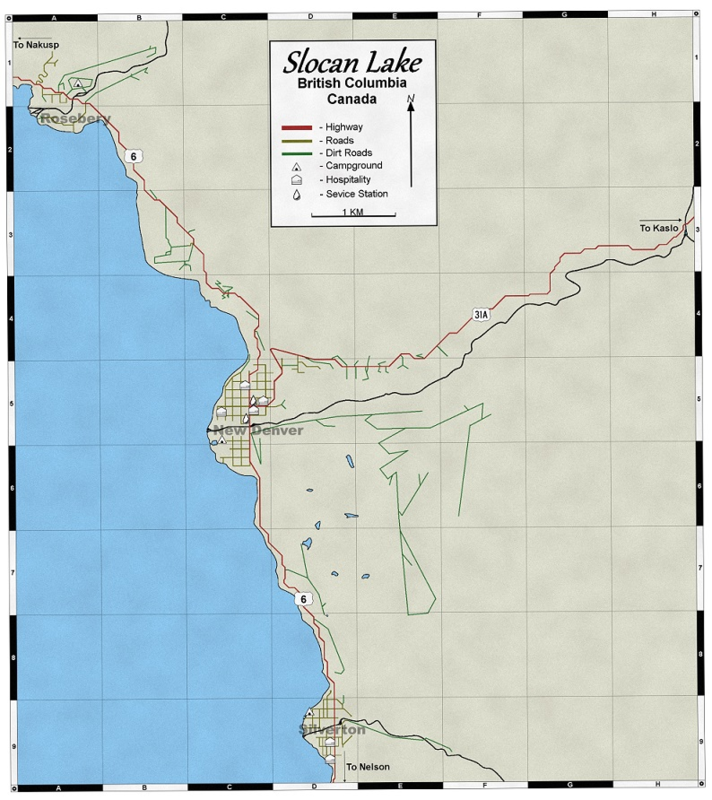 The new version of Slocan Lake now has vehicle spawns and lootable maps, and no longer covers up areas of the vanilla zomboid map. You can find it here. This week’s pile-up from Maris. A general list of stuff added to PZ, and vids of features being worked on, is kept here – so you don’t have to plough through endless dev blogs for info. The Centralized Block of Italicised Text would like to direct your attention to the PZ Wiki should you feel like editing or amending something, and the PZ Mailing List that can send blogs like this and patch notes direct to your mailbox. We also live on Twitter right here! Our Discord is open for chat and hijinks too. Oh, and Happy Thanksgiving to all our American survivors! We’ve currently got the final Build 40 patch in a public IWBUMS beta, and since last week have released 40.37[theindiestone.com] and 40.38 [theindiestone.com] into it. This includes Turbo’s new night shaders and more colourful/useful interior lights, flashlights and headlights as we felt that Build 40 had moved away from what we wanted in this respect. You can see the video of this from a previous Thursdoid here. So far IWBUMS testers have reacted really positively the new nights, which is heartening to see. 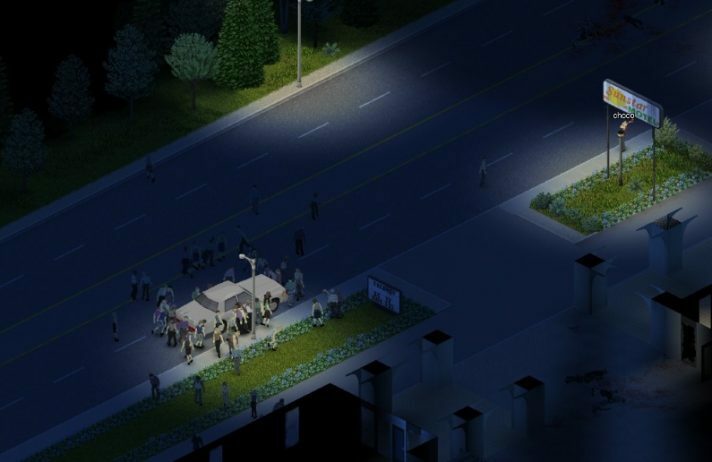 We’ve had quite a few comments like “Night-time looks like the old PZ nights and flashlights finally have a function, this is amazing!” and similar, which is exactly what we were hoping for. IWBUMS beta 40.39 was due for release today ready for the public patch, but Stas is still hitting a chatbox whisper bug with a code hammer. It will also add in, upon arrival, a fix for players getting wet in some player constructions and add back in the system we have that governs on how dark nights are depending on how bright the moon is. Turbo has also added the dither circle stencil to the weathermask system (the ring of visibility around the player) when it comes to being inside buildings, which really improves the look of it all. Here’s a video of it without, and here’s a video of it with. Work continues with the AnimZed tool, clothing, layering, spawned zed outfits and similar. There’s still loads of stuff to do under the hood for 41, but we’re now in a position to hopefully provide more visual updates in blogs each week. This first video touches on what we discussed last week – the ability to layer clothing in whatever order we/you please for added player/zombie variety. 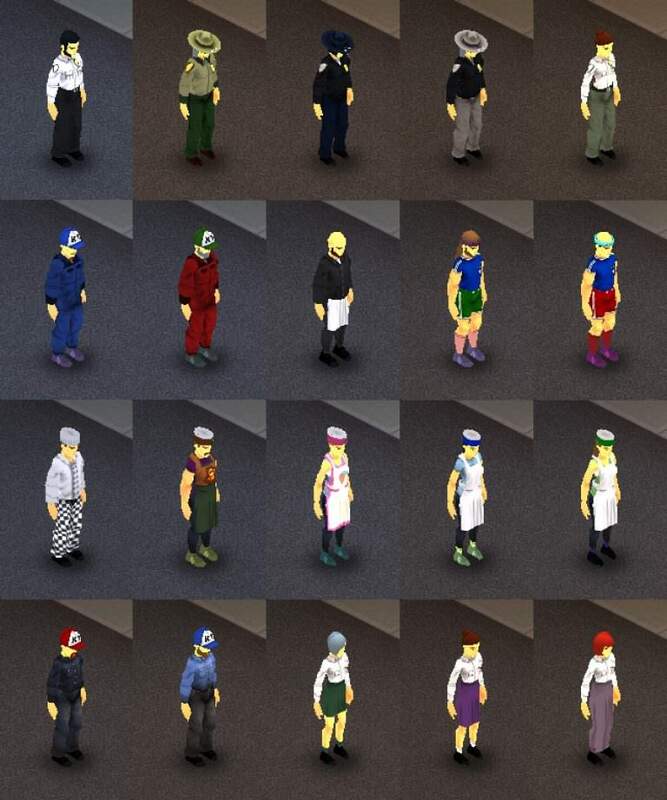 This allows for full length clothing items like dresses, different sorts of shoes, the ability to wear an apron under a jacket, different underwear etc. This week Zac has also added a zombie spawn test function that creates zeds wearing different outfits from our assigned collection – or all dress the same. This is so we have a convenient way of testing all the different randomized and non-randomized clothing items at once. Finally for this section, here are some of the dev-defined Career Zed outfits that the system’s easily conjuring up for Martin. Yuri this week has continued working on the code for calculating the direction of water movement that we discussed last week – meaning that the game now knows where water should be still and where it should flow. He’s also fixed some model issues he was having with the anims build, and improved the way banks look. As we’ve said before, it might look too realistic in some aspects of it – but the different quality options give us room to play here. Chris W is back with us and back in the code, picking up where he left off with improving the way that building interiors are displayed – to the extent that one day our aforementioned friend the dithered visibility circle stencil will no longer be a requirement. • Stas continues his work on the ControllerTest Build, with a fixes version released to testers today[theindiestone.com]. If you would like to join in the test beta and earn yourself a free PZ code, enquire within[theindiestone.com]. • Bitbaboon Steve is back with us and investigating ways to optimize MP. • RJ is looking into ways to allow us better control over our loot spawn system and difficulty levels, given the many new items that future builds will bring. • Mash continues with her work/marathon in the creation of our take on Louisville, and is currently creating the crumbier/seedier end of town. This week’s plea from the forum from Sick Boy[theindiestone.com]. 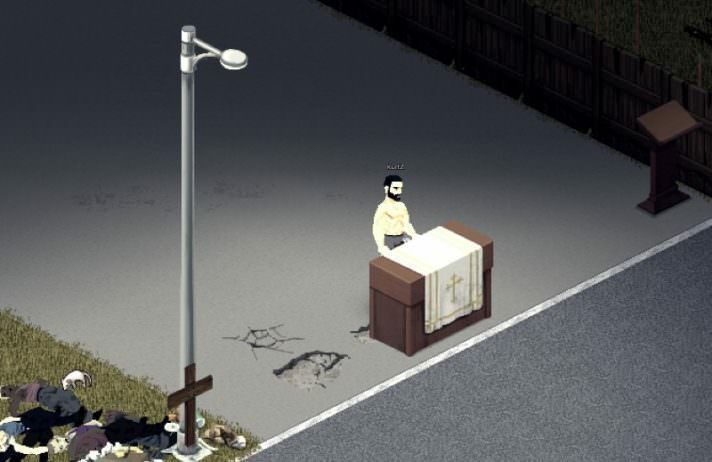 A general list of stuff added to PZ, and vids of features being worked on, is kept here[projectzomboid.com] – so you don’t have to plough through endless dev blogs for info. TheCentralized Block of Italicised Text would like to direct your attention to the PZ Wiki[pzwiki.net] should you feel like editing or amending something, and the PZ Mailing List [projectzomboid.com]that can send blogs like this and patch notes direct to your mailbox. We also live on Twitter right here! Our Discord [discord.gg]is open for chat and hijinks too. • Improved darker nights, and less washed out night-time interiors. Car headlights and flashlights will be more of a necessity now. Sandbox settings also updated, so you can adapt it to a brightness you desire. • Improved appearance of weather effects when in a building. • Moon calculations re-added to game to govern night brightness. • Extended disassemble ability to many more items,including: fridges, ovens, more chairs, washing machines, lockers, fitness equipment, metal barrels and some missing shelves. • Some balanced player actions related to injuries, sleeping, window-breaking and bandages in a saucepan. • Fixed whisper problems in the new chatbox, stair teleports, rain rather than snow in Winter is Coming, community translation font issues, plumbed sinks not working in MP and various other issues. While the rest of the team move into the animations build and version 41, we’re leaving optimization specialist Bitbaboon Steve investigating what easy-win MP networking improvements we could potentially still patch into 40. The first of his discoveries, the removal large number of empty and unnecessary data packets being sent over the server, has been released in 40.40 and should be a mild salve for current lag issues but his investigations also came up with an idea we thought it’d be wise to test out with a forthcoming IWBUMS beta and Community Megatest. Essentially, Steve has been working on some server configurable optimizations for zombies in multiplayer. Since vehicles, performance in multiplayer servers has seen added strain (particularly in handling zombie hordes) and we’re hoping this might improve matters. In essence, we’re about to release a test version in which there are several configurable options to allow server owners to fine-tune how much zombie data is sent to their players. There will now be two ‘player client zombie awareness’ circles: the first a smaller radius that defines at what tile-range zombie positions are sent to clients with a high precision in every frame, and then a second larger radius in which the zombie location information can be sent to clients less frequently. Server owners will also be able to play with how much time there is between the low frequency updates. On low population co-op servers these values can be set pretty liberally, so the players are getting all zombies in the visible area smoothly. But on high population servers that experience lag issues, server operators can sacrifice the smoothness of zombie movement in the distance (or even cap zombie visibility completely over a certain distance) in order to VASTLY reduce the amount of internet traffic they produce when lots of players are involved. We think this will sharply decrease the amount of work the server needs to do and should lead to a much better player experience with a little bit of visual compromise toward the edge of the screen. Distant zombies might pause a bit or appear to teleport slightly between updates, but these movements are also something we’d hope to blend better (and make far less noticeable) with the added functionalities of the animations build. Server operators can decide on their own level of compromise too. This work is pretty much done, and as such we will add it into the IWBUMS beta as soon as it’s clear there’s nothing from 40.40 that needs hot-fixing. Please keep your eyes on the forum if you want to participate in a special Yuletide Megatest. This week in TEA-land Grant has improved things dev/modder-side with live texture reload, through upgrading the Filewatcher mechanism. It now watches the media folder instead of polling individual files, and is much more efficient. Upon a texture filechange, the game now reloads it live and in-place. This should make iteration times on textures much easier and faster. Martin has also been creating a better range of skin tones for player characters, to allow for better customisation should people desire it. • Stas has just updated the Gamepad Test beta with a lot of fixes[theindiestone.com], for our lovely select bunch of gamepad testers. If you fancy helping out with this part of PZ work, and earn yourself a free code, then enquire within[theindiestone.com]. • RJ has been tinkering with in-game loot, and has occasionally been popping into the PZ Discord to look for willing testers. The overall plan is to have more information in the game code in terms of what’s a desirable item, and what’s junk – so we can then fill containers with a lot more realistic junk items even on higher difficulty levels. He’s also experimenting with having more specific containers in homes for more specific items (all the cutlery in one drawer, male clothes in one wardrobe, female in another etc) but the jury is currently out on whether it actually detracts from the looting gameplay. • ChrisW’s work on in-building Sims-style cutaways and the abolition of the dithered circle view stencil continues. As seen here both with, and without. Today’s warehouse horde from Frank. 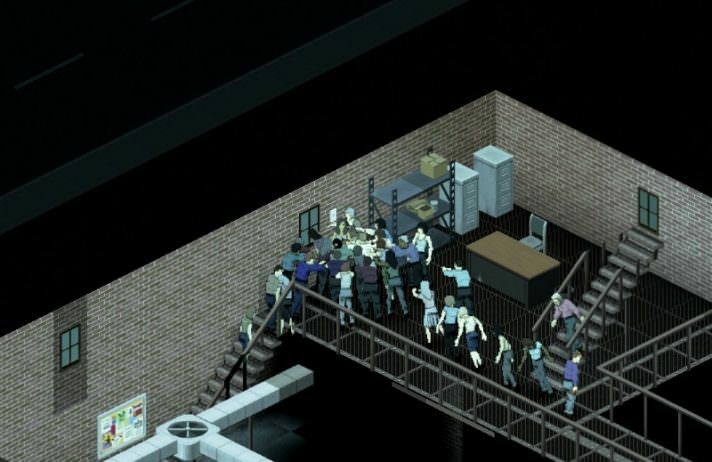 A general list of stuff added to PZ, and vids of features being worked on, is kept here[projectzomboid.com] – so you don’t have to plough through endless dev blogs for info. The Centralized Block of Italicised Text would like to direct your attention to the PZWiki[pzwiki.net] should you feel like editing or amending something, and the PZ Mailing List [projectzomboid.com]that can send blogs like this and patch notes direct to your mailbox. We also live on Twitter right here! OurDiscord [discord.gg]is open for chat and hijinks too.